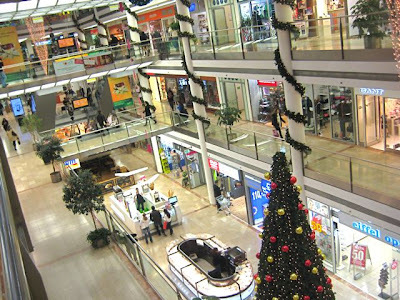 These shining shrines to retail worship are spreading rapidly in the Czech Republic. To be honest, I don't like the malls here. There's no high principle involved. I like American malls just fine. It is just that Czech malls sell things I don't like for more money than I want to pay. Which is why I dropped by the Palác Flóra mall recently. 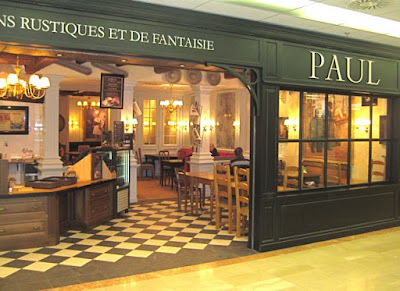 I'd heard that Paul, the cafe, patisserie, and bakery, had opened there. The company has a storied history that traces back more than 100 years ago to a town in northern France. Now, they are all over Europe. 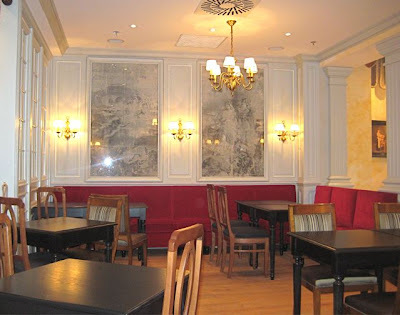 The interior recreates a little bit of France inside the mall. It was empty late in the evening, but very full during the day. 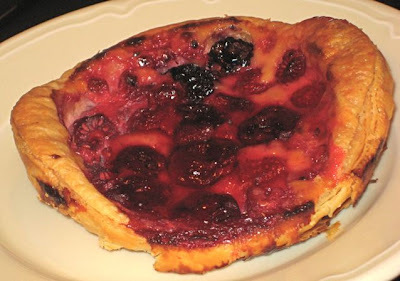 On my first visit, I had a forest berry tarte (55 CZK). 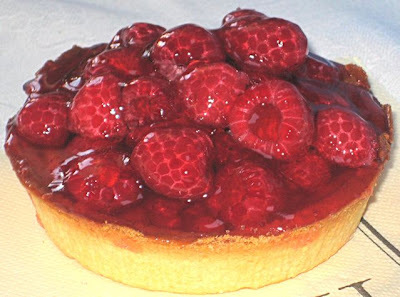 A creamy, sweet, tart tarte. Good. I was waiting for my friend, who was watching the IMAX film "U2 3D." So, I had a .33 liter can of Pilsner Urquell (45 CZK) to wash down my tarte. You might think it is an odd combination. And you'd be right. 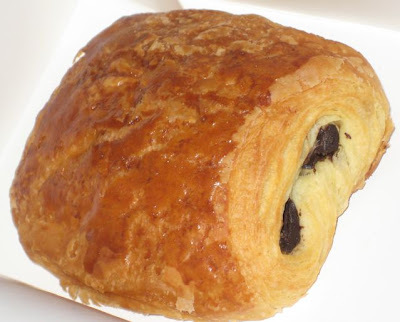 I took home a pain au chocolate (19 CZK). It has two bars of chocolate inside. I wish there were three. It was good, but since I bought it at the end of the day, it was not the freshest. I think if I had popped it in the oven at home a few minutes, it would be great. I must try that. They also have plain butter croissants (19 CZK). There were many varieties of bread (37-75 CZK), including baguettes (24-27 CZK). I also got a Moelleux Chocolat (44 CZK), a traditional dark chocolate cake. For some reason, it was placed upside down in the box. And I present it to you thus. I zapped it for 30 seconds in the microwave in my kitchen. I recommend this. 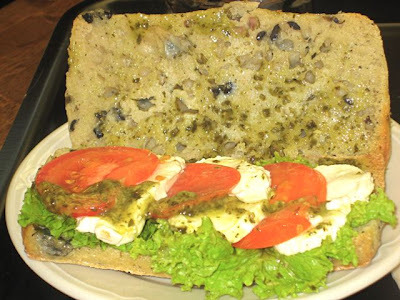 It brought up a wonderful aroma along with the rich flavor and texture. I had a coffee cream eclair (45 CZK). They labeled it as a banánek or little banana. It was fine, but didn't rock my world. 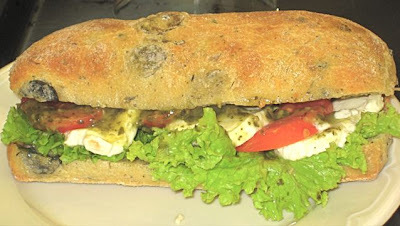 On another visit, I tried one bread product -- a tomato and mozzarella sandwich on an olive ciabatta (69 CZK). It was a little too much bread and not enough stuff in between. The mozzarella was good quality. The tomatoes were bland, but covered with a sour dressing. It was filling, I'll say that. There were other sandwiches with prosciutto, ham, and such. There were also salads (129-149 CZK). I had a bottle of Bonaqua water with my meal. It was fairly priced for a mall (25 CZK). I took a raspberry tarte (64 CZK) home after this visit. I'm something of a connoisseur. When I first met V, she was working in a French cafe and understood my passions all too well. She used to bring me the most incredible raspberry tartes from the shop. The best ever. Paul's was OK, but I don't think I'd get it again. It had a lot of raspberries, but the fruit was surrounded by an intensely sweet gelatin that I didn't like. There was a thin layer of cream on top of the crust, but I wished for a bit more. The last things I tried were the chocolate tarte (44 CZK) along with a mini-croissant (7 CZK). 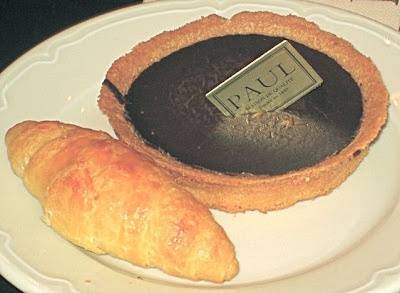 The tarte was my favorite of all Paul's offerings. There was an intense chocolate with the consistency of butter that melted smoothly in my mouth and caused my eyes to roll back in my head. It was a real chocolate high. 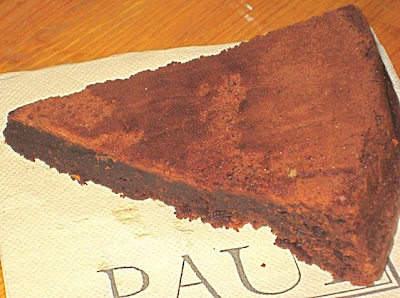 This chocolate rests inside a crust of mostly butter and sugar. Sweet and also a little salty, it was the perfect, decadent match of flavors. I don't see how I can avoid buying one of these on every time I'm there to see a movie. I loved it that much. 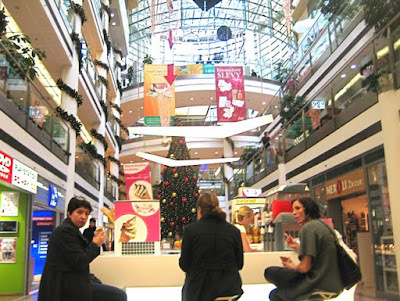 In fact, it was the closest I'll get to a religious experience in a Czech shopping mall. 45kc for a small can of Pilsner? Nuts! Thanks for a new installement. Paul all over Europe ? I didn't know that. I have been to only ones in France. > it was placed upside down in the box. Perhaps so that you can put it right way on a plate easily, tarte tatin style ? A pain au chocolat for a few minutes in a oven? Careful, the chocolate will melt completely. 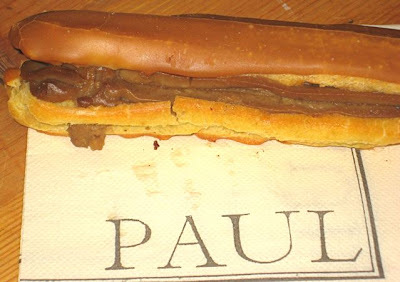 Paul shops in France have two pricings, one for take-out and another for eating in (more expensive that take-out). Is it the same way in Prague? 1. There are Pauls in Belgium, Spain, Great Britain, and Holland. There are also outlets in the Middle East and China. 2. I think it was upside down to hide a rather imperfect and broken top surface. 4. Didn't notice two-tiered pricing. Certainly wasn't listed that way on price signs. Can't say for sure. Forgot Switerland, Morocco, and Japan. isn´t the two-tier pricing common in certain countries, including France and UK? 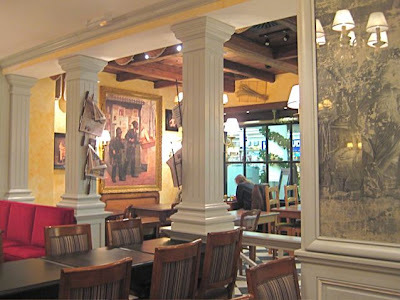 If understood correctly, it´s not because of the place you´re eating at, but for tax reasons - certain states and countries tax food "to go" as grocery purcahse and therefore lower than food "to eat in", whether it´s french fries at the big M or a restaurant meal. you say that for you prague malls are expensive. For me (I live in Israel), on the other hand they are really cheap. thats why i go there once a year. itsw just amazing to see how the concept of praucechances from a place to place. I love your blog! keep the good (and tasty) work! Brewsta: oh why oh why did you have to go and announce this to the rest of the world? But to the pastries, wow, they are amazing. 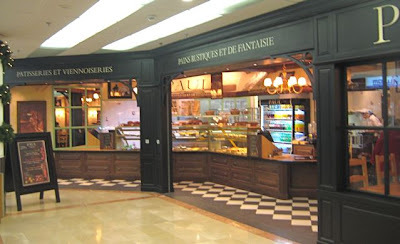 Pain au chocolat (ha ha, say that in English...), their tarte aux pommes (or apple turnover, if you prefer), are great. I do not see a mille feuille, but I am there only later at night and perhaps they're already gone by then. 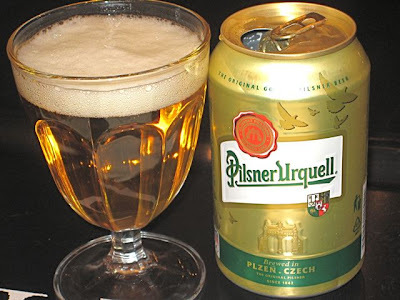 A CAN of Pilsner for 45 kcs??? WTF??? DM is right next door, there's a certain place that does draught Budvar on the top floor for considerably less money, or there's Albert on the same floor for the more cheap-but-demanding thirstian. Paul is a very nice addition to this part of town, but let's try to keep it quiet! Michaela, you are right, I think, eating in, you pay restaurant tax (higher), eating out you pay like when you buy from a super market lower taxe. 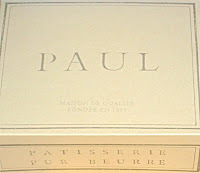 Living in Geneva Switzerland, I'm not aware of any Paul here (Swiss Romandie - French speaking area). Maybe in Swiss German area, curiously, even though the original Paul is French? 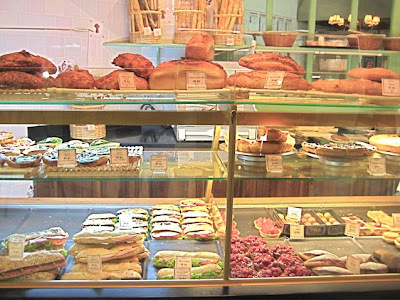 Regarding 2 pricings (I wrote taxe above but it may rather be a question of service charge that should be included in France when you eat at restaurants), at least in France, when you see the breads in the showcase, it's easy to notice. You question yourself why 2 prices on the same tag for the same bread? If you didn't notice, that probably means they don't do that in Prague. hmm my French soul is a bit insulted about the outfit they pull off - it s not French I protest! Having said that but I like their bread - they have some of the very thin "flutes" not easy to find elsewhere quite tasty. I would rate the pastry average to good - which is quite good here in Prague !